"Jesus has a very special love for you. As for me, the silence and the emptiness is so great that I look and do not see, listen and do not hear." What are we to make of these words from Mother Teresa? Is it disturbing knowing she experienced a crisis of faith, a "dark night of the soul" lasting close to five decades? 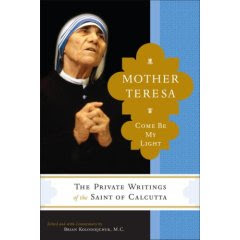 Mother Teresa never abandoned her faith or her work even though in letters published in Come Be My Light she compared her spiritual pain to hell and even stated at one point it drove her to doubt the existence of heaven and even of God. Is her legacy lessend by her doubts? What can we learn about faith, love, hope and charity from her life revealed more fully? See the informative, inspiring TIME article for more on Mother Teresa's revelations. That was a very interesting article for me. I guess I don't find it disturbing. I think it simply makes her life even more real and powerful. That she faced real hell and pushed through it. Even Saints go through spiritual angst. It makes one's faith even more solid after going through such trials. May God rest her soul. To have God call you to service even once in His name is astounding. To expect continued conversation is hubris. This what she fought the rest of the time. And being empty and silent inside may mean more than what it seems, especially to those on the spiritual path. I don't know why it would be disturbing. It was in some ways uncanny, in others providing a vocabulary to describe my own experience. Darkness, yes, and I suppose I've learned to live with it. Tommy; Thank you, thank you for your comment on my blog. Even tales of the utterly ordinary mean something, and have their ways of connecting in ways that others' don't. I don't find this book "disturbing". As someone who struggles with my faith, but loves my God, I find this book comforting. I am more at peace with my struggles when I read that someone as obviously holy as Mother Theresa struggled also. It gives us hope. I agree with you- I am more at peace as well. That is really interesting. I think I've read that before about her period of pain. Unfortunately, I believe that her dark night of the soul was not necessarily from God. She had the choice to enjoy her life or make it miserable. The dark night of the soul was just psychic entropy. I remember going through complete darkness for a period of my life. But when I learned that we have control over what we experience when we choose to raise our level of consciousness, I simply chose to be happy, and ended my depression. Doing God/Christ's service is the most joyful thing in the world. It is sad that she was ignorant to the proper use of the mind. Christ told us that we will sow what we reap. When we sow happy thoughts, we reap a happy existence. It is very simple.